The first edition of The Masters golf tournament since the end of Nevada’s virtual monopoly on legal sports betting last spring will have many sports fans in the seven newly legal states tempted to throw a couple of bucks on a favorite golfer to win the tournament. But there are so many other betting options out there: a golfer to finish in the top 5, top 10, top 20, top 30, first-round leader, lowest 18-hole score over the four days, and so on. There are even markets on whether top players in the first round will shoot 69 or better; 70 or 71; 72 or 73; or more than 73. Confession time: I am in my fifth year of a 32-week annual PGA Tour golf pool with a dozen rivals. The challenge is that you can’t pick any golfer more than four times. When to lay up, and when to go for it? It sort of feels like a round of golf itself. So with any luck, paying way too much attention to the Tour on most weekends will help me offer good plays in a variety of categories. Some players are much better picks in one betting market than others, as I’ll explain. If you like the storyline I offer on a player, feel free to bet him “across the board” at multiple levels — but maybe lean a little more heavily on the preferred category. There probably aren’t more than 20 golfers in the field of 82 who can possibly be expected to win. It takes a special breed of player to be able to stare down the pressure and earn the green jacket on Sunday. Rory McIlroy (+700): I wouldn’t usually recommend the tournament favorite, especially at just 7/1 (it’s hard to win a major). 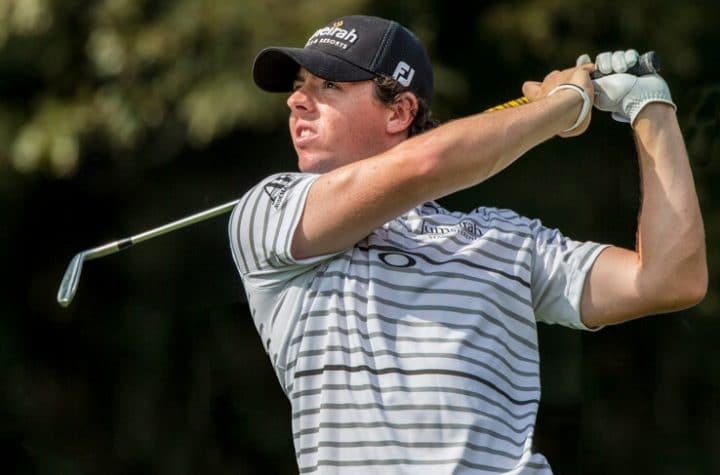 But McIlroy has talent, momentum, and maturity on his side — and the exhilaration of recently winning The Players Championship over a monster field to capture the so-called “Fifth Major.” Rory says he has been too timid at Augusta National in previous years, and that is about to change. I’m listening. Justin Rose (+1200): I found him at +1400 as my Masters pick on last week’s Gamble On podcast, and love him at that price, and he’s still a solid bet at +1200. The two-time Masters runner-up has a game built for this course, and in his late 30s he has found an extra gear. He expects to win — and I don’t blame him. Francesco Molinari (+2200): Another European late bloomer and the reigning British Open champion (I don’t work for ABC, so I don’t have to call it “The Open Championship” like they do). Dominated the Americans in the Ryder Cup team event last fall and has a scary serenity about him. He has never placed in the top 20 here, but he’s not that same player anymore. Jordan Spieth (+2500): Do you feel lucky? The lone American gets into this foursome of picks because while it’s more likely that his “head case” woes continue, there’s a puncher’s chance that the aroma of Augusta’s magnolias snap him out of it. If he contends, he can definitely win. Starting with last year, his finishes are 3rd, 11th, 2nd, 1st, 2nd. And you’re getting 25/1. Dustin Johnson (+200): Three straight top 10s here and nearly always contends. Not the perfect course shape for him to win so he misses that first listing, but he should be around come late Sunday afternoon. Rickie Fowler (+400): He could win, too — but he probably won’t. Even his long-awaited fourth Tour win that came earlier this year at Phoenix featured a final round, sphincter-tightening 2-over-par 74. He might need similar cooperation from rivals to grab the win, but he seems like better than a 4/1 shot to get close. Warning: Has shot over par with a 54-hole lead seven times in seven tries. Paul Casey (+550): Yet another middle-aged European figures here because of course history and an improving trend in majors. Sixth, fourth, sixth, 15th in his last four Masters — and has elevated his play this year. Louie Oosthuizen (+750): The South African is one of the few players to ever be a runner-up at all four majors, and he is in good form. Has a knack for “backdooring” a fine finish with a strong Sunday score. Jon Rahm (+175): The burly Spaniard seems like at least even-money to me to achieve this rung on the ladder. He’ll hit a foolish tee shot and miss a critical putt or two (he even got a little salty with a question about his temperament in a pre-event media interview), but he is a top 10 machine — eight of his last 10 stroke-play events plus a 12th — who rallied for fourth on this course last year. Tony Finau (+300): Talented young American who is not quite ready for prime time, but he’s getting there. Nice odds on a raw talent. Matt Kuchar (+300): Even more of a “Backdoor Man” than Louie, unsurprisingly making birdie on his final hole on Sunday to grab top-10 status in a tournament he never had a prayer of winning. Xander Schauffele (+350): Who? You should know the X-man, who won the season-ending Tour Championship in 2017 as part of an elite 30-player field. Still learning the course, but he could definitely win this event in the next five years. He’s fearless. Top 20: How about a steady Eddie like Patrick Cantlay at +138? Top 30: Did you know that Charles Howell III is 19th in PGA Tour history in prize money earned at more than $38 million? You didn’t, because he almost never wins and rarely contends. But he’s a top 10 and especially top 20 machine. Top 30 at +138? In a half-sized field? Collect your boring money. Lowest first round: Avoid slow starter McIlroy, even at +1400. Australian Marc Leishman at +4000 is a little intriguing, but this is kind of a silly bet. Lowest round of event: Try a lightning-in-a-bottle player like Tommy Fleetwood of England at +2500. Yes, I haven’t found a place for Tiger Woods in these predictions (aside from the goofy prop bet by someone in Vegas). Part of me still fears him, but the bottom line is this: He dominated this event because hard as they tried, back in the day they just couldn’t “Tiger-proof” the course. As a result, Tiger won by utterly crushing the par 5s. Not only can’t he do that anymore, par 5s are among his Achilles heels relative to other Tour players. And he’s only +164 for a top 10 — and this for a guy whose back has acted up of late. If you’re trying to talk yourself into him, remember that only two weeks ago Tiger took down the great McIlroy in the match-play Round of 16. And if you’re getting too excited, recall that he missed a four-foot putt on the 18th hole later that day to lose to someone named Lucas Bjerregaard of Denmark. Devondeep Bling is an amateur out of UCLA who is a mere +200000 to win. Fun, but no. If you want a name-game flier, try Kiradech Aphibarnrat of Thailand at +20000. It’s one fewer “0,” but don’t be shocked if his name turns up on the leaderboard at least briefly at some point this week. He has contended and won all over the world, and finished 15th at Augusta in 2016. I’m saying there’s a (slim) chance.